Today I can happily announce that we now boast a full deck of Chaos gods! Pillar of the community and all around nice person Kraut Scientist (AKA Kraut AKA Krauty AKA Arnie) will be building a Khornate warband and join in the fun. As a long time follower of the Lord of Skulls - Kraut has a legendary World Eater army sporting a number of impressive conversions - his inclusion was a no-brainer. 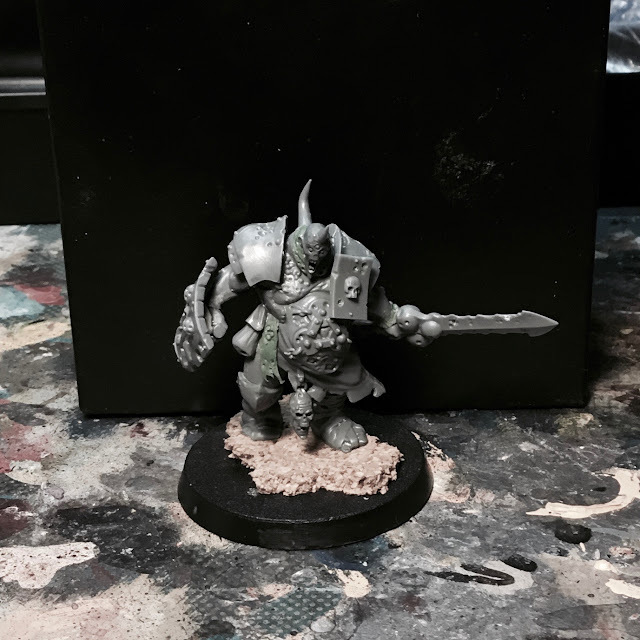 On the Nurgle front, things are moving appropriately slow but steady - last night I threw together the fourth Blightknight so there´s only one to go before I move on to the chaos warriors. Excellent news and a very warm welcome to Mr Kraut. I'm happy to have you aboard buddy! I second this. it felt weird without a fourth horseman! Kraut for the Kraut god! He looks really intimidating with that head! And it suits him surprisingly well, with the three eyes positioned the way they are they remind me of the nurgle symbol. I missed that, you are quite correct. Very intimidating warrior. Yep - that was the thought! When I made my bird champion I realised that the eyes of the tzeentch sorceror are strangely similar to the plague god symbol - the head has been sitting in my bits box since then waiting for the right mini. What excellent news! I cannot think of a more fitting person to create a warband to the mighty Blood God. It will be exciting to see some his creations. Your new Blightking is quite charming in a revolting way, he he. As mentioned above, the head is perfect, the three eyes mimicking Grandfather Nurgle. Additional, its small size further emphasizes the bloated gangrene limbs of his. It's great to have Krauty's aboard - we've been courting him for a while and he finally said yes. We're so happy. He looks Savage. I absolutely love that shield. And that spike on his back is really nice. That shield is my absolute favourite from this kit - it's got a true old school charm. But seriously: It should go without saying that the honour is really all mine. In fact, given the quality of the other guys' work, they will surely be giving me a run for my money. But you know how it is: Khorne cares not whence the blood flows,... and all that. What? Krauty's on the way for fantasy? Great news for the blood path !And your last Blightking is The mini wich fit with the Khornate teaser ! So brutal , hypnotic ! Great choice for the three eyed head ! You, definitly Sir are Nurgle's Paragon in this world ! Nice work my friend, and all the best for Krauty !